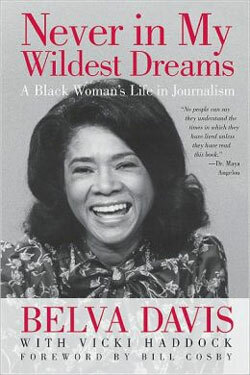 To describe Belva Davis’ book simply as a memoir by the first black female news anchor in the United States is to ignore the inspiration and history lesson that this incredible book provides. Davis takes us on a journey, from her birth in 1932 in deeply segregated Monroe, La., during the Great Depression, through a lifetime filled with an uncanny ability to overcome obstacles and surpass even her own expectations, to the 21st century, when she has been honored with accolades and awards, including eight local Emmys and Lifetime Achievement Awards from the National Association of Black Journalists and the Northern California Television Academy. Her odyssey can only be described as extraordinary. Although it may not have been her intent when she set out to tell her story, Davis’ memoir surely can inspire young journalists to take on bigger, even seemingly insurmountable challenges, both professional and social.